Ideogram Series. Cloisonne Enamel, silver, gold, baroque pearl, rubellite. Etruscan chain made from fine silver and 24K gold, baroque pearls, 16 layers of cloisonné enamel on sterling silver and fine silver, 24K cloisonné wire and bexels, 18K finding in back holding pink pearl, 14K jump rings and wrapped links. Includes extra length of chain with pearl. Hand polished; signed by artist. Cloisonne Enamel, silver, gold, baroque pearl, rubellite. 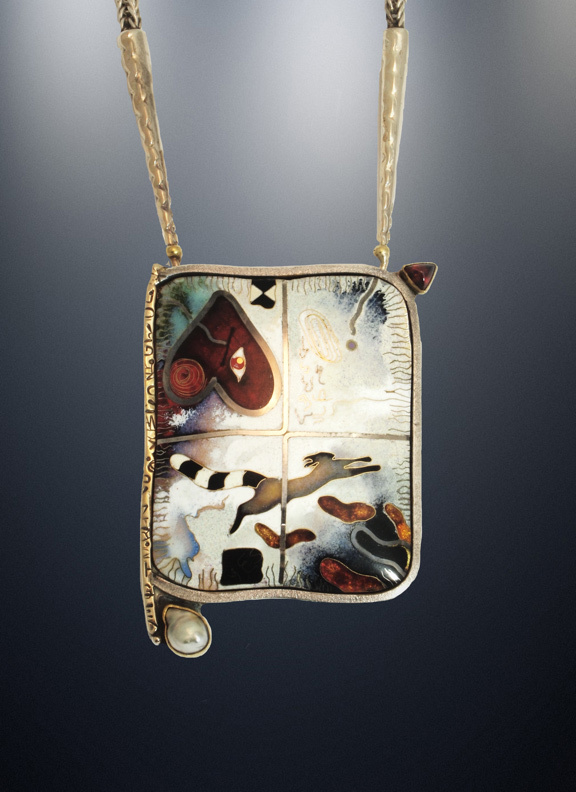 Colette (b.1937) is a self-taught artist known for her mastery of cloisonne enamel. Her technique involves multiple layers of enamel which can sometimes require twenty-five firings per piece. In 1978, she received the Prix d’honneur at the Limoges Biennale other awards include, 2009, Lifetime Achievement Award,The Enamel Arts Foundation, Los Angeles, CA, 1999,Trustee Emeritus of the American Craft Council,New York, NY. There’s an irony to discussing Colette’s art because so much of it lies literally beyond language. She is a storyteller of emotional journeys, but the stories tumble out in mimetic fashion – where the arrangement of color, line, symbol and image conspire without a word being spoken. These are pieces that define “evocative” – they elicit a response that lies beyond verbal logic. A given image may delight or sadden us, and we’re not quite sure why. Words for the story remain elusive, but the tactile contrast of gold and glass conjure the tale’s emotive force. Colette has been making enamels since the early 1970s, but in 1989 a vigorous emotional directness emerges in her work. Not to belabor the biographical connection, but she began the Ideogram series that year while recovering from a serious illness, a recuperation characterized by sensory deprivation. (An “ideogram” is a symbol or picture of an object or idea for which there are no corresponding words – an apt description of the work.) The Ideograms also mark a radical shift in approach for Colette, who had been making increasingly intricate enamels with multiple cloisons and masterful shadings of color and texture within each well. The Ideogram series wiped the slate clean, stripping her vision down to its essentials. Compare, for example, the color-drenched complexity of Requiescat Pectoral #6 (1989) with Ideogram #3 (1990). The bird, the blood, and the heart appear in both (as does the cat, transformed), but the Ideogram is like slicing open a sedimentary rock to reveal a layer of fossils. Here the characters are preserved, golden lines of desire (rather than compositional planes) hinting at their relationships. Both pieces deal with the calculus of loss, one as an outcry, the other as an elegy. This process of simplification is hardly unusual – many artists go through it as their work matures and they employ their technical mastery not so much to dazzle but to communicate. That’s certainly been Colette’s direction in the last half dozen years. As her compositional style and figurative modeling have simplified, she has incorporated gold wire “script” to embed additional layers of meaning (and emotion) in each piece, making it both more dense with information and more distinctly personal. Her idiosyncratic alphabet of “feelings” may appear within the enamels or may be drawn on the metalwork settings. Many larger pieces also contain these marks on the underside or interior of the settings as well. They are like whispers, small confidences imparted by the artist to the wearer but hidden from the viewer. Colette instills her enamels with memory and associations, which is part of what makes her newer work both disturbing and deeply satisfying. To don a Colette is to consent to an intimate relationship with the artist, to become her confidante. The imagery derives from Colette’s 1ife journeys” – journeys of the emotions, travels (and travails) of the heart. Cat, bird, heart, drops of blood catch the eye and the imagination. Closer examination reveals other recurrent motifs: the ladders, boxes (or are they coffins? ), the wrapped or cocooned cat, the bullseye, and, as a nod to time ebbing away, the hourglass. Precisely because these images and symbols are indirect – that is, because they have no direct correspondence in language – they bear both the urgency of speech and the mystery of visual art. This paradox becomes explicit in the Pictogram series that largely follows the Ideograms. (Actually, Colette goes back and forth between series, only working exclusively on one when she begins it.) In general, the Pictograms represent the re-infusion of Colette’s full palette of colors into the streamlined compositional approach of the Ideograms. The symbols of loss and gain become more prominent, and recognizable words and numbers also proliferate, written in wire or cut into the metal settings. Two pieces from 1991, both in museum collections, reveal Colette in the midst of experimentation. The Rhode Island School of Design’s Pictogram #7, as elegantly dark as a Handel requiem, shows her re-inventing the compartments of pre-Ideogram enamels as spatial elenents. The “speech” so evident in mysterious script is impenetrable, but clearly passionate. By Pictogram #18, owned by the Oakland Museum, the scene is populated with animate things – the bird, the heart, the moon – that glow with an intense golden light. Space also begins to shift away from divided images toward a linked and partially unified landscape of internal motion and external experience where decreasing numbers hint at loss and inevitable solitude. A similar numeric code is at work in some of Colette’s paintings, which have been a private art but which she plans to begin showing. Requiescat 2 (1995), for example, recapitulates the elements of Pictogram #18 but in a broader concept of space. Colette frequently uses largescale canvases (roughly three by four feet) to explore colors and symbol through a more immediate medium of expression. Alkyds and oils give her much the same color intensity as the fused glass of the enamels, but the paintings inevitably contain greater volumes of space. Themes and compositions that appear in the enamels often originate in the paintings – and vice versa. 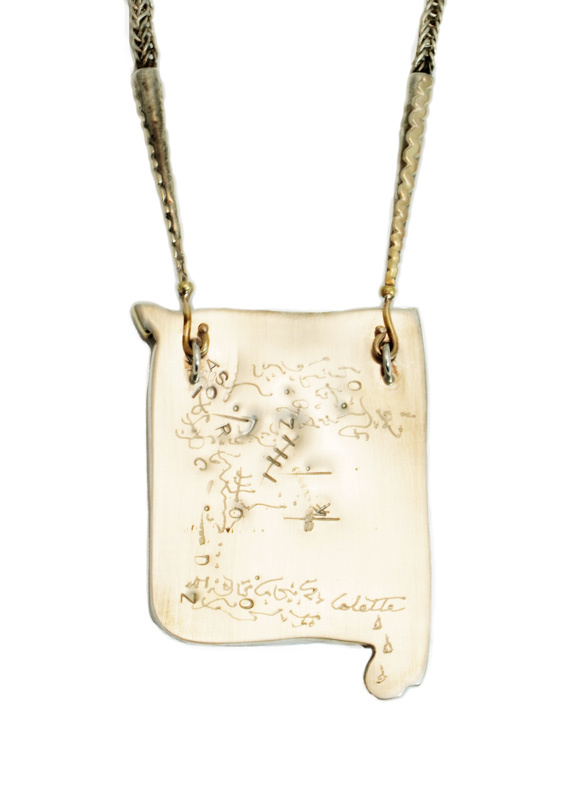 Being an artistic autodidact has served Colette well, for the enamel tradition is one of miniture decorative and occasionally devotional objects. But Colette approaches the form like an illuminator with a modernist sensibility regarding color and space – as a painter. As a result, she imbues each miniature “canvas” with layers of meaning and intention as she builds up layers of glass in the cloison wells. In the midst of the Pictogram series, Colette produced another series of enamels based on imagery that she says she absorbed “by osmosis” from the pages of a calendar illustrated with New Guinea face paintings. The Calendar group is unusual in Colette’s work because it emphasizes portraiture rather than narrative landscape. The mask imagery dominates each piece with representations of the extremes of human expression. While some of Colette’s more familiar symbols appear (a ladder, a hand, the hourglass), the overall effect is a radical departure – although in some pieces we see faces transformed from human to feline or avian. The stylization of the masks derives in part from the nearly pure abstraction of the Bullseye enamel series of this same period and from some of the experimentation in the first phase of Pictograms, especially the deeply charged Pictogram #8, with its jutting arrow, tumbling hourglass and bullseye pendant in gold. The masks have a primitive power in their composition and a haunting beauty in their execution, for Colette calls on her remarkable command of opalescent and transparent enamels to create images that literally shine in their emotional intensity. They are “dark” pieces – “I’m attracted to darkness,” Colette admits, and the blacks, reds and maroons hint at an ominous shadowland. Yet within each piece are what she calls “small chinks of blue, suggesting tiny bits of pleasure.” That’s not to say that they are works about human misery, but rather expressions of deep and primal emotion. Ultimately, the masks are a fitting motif for an artist whose work crystallizes the tension between role-playing and personal disclosure, between emotion as it is felt and as it is expressed – or stilled. Without question, the masterpiece of the Calendar series is the exuberant The Flesh Is Weak, a necklace of 24 pieces. 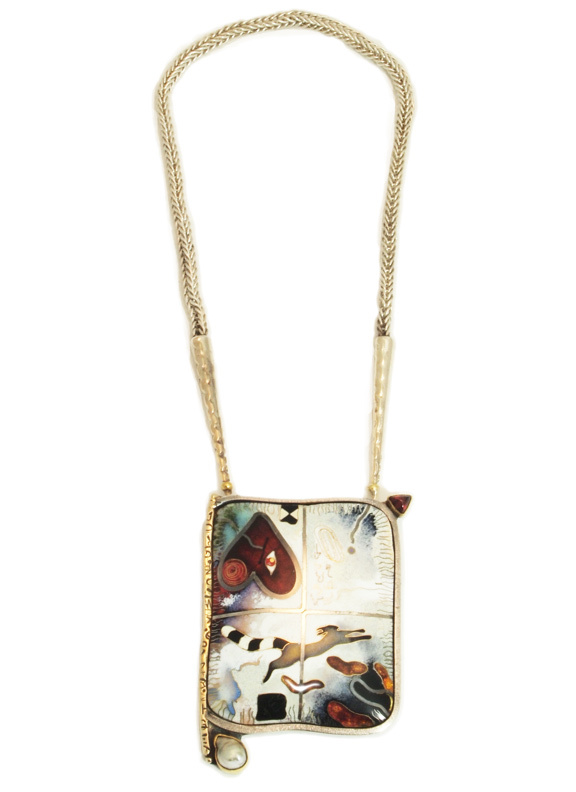 Four major cloisonne enamels are interspersed with settings of semi-precious stones in gold. The settings are fabricated by metalsmith Jennifer Banks from Colette’s designs. Banks has been working with Colette in her Petaluma, California studio throughout the 1990s, starting as a student assistant and maturing into a master jeweler. The central enameled mask figure is a tour de force: a declaration about the gradation of thought and feeling from the smooth exterior of the public face to the interior and mysterious layers of color and texture suspended in the receding depths of the cloison wells. Patricia Harris and David Lyon write about the arts and fine crafts for national magazines.